India is witnessing a chain of festivals at the moment, and the excitement over the celebrations is never hidden. Almost all the corners of the country are observing their traditional Hindu New Year festivities, with the onset of spring. Yes, the season, here is celebrated with much enthusiasm and fervour. 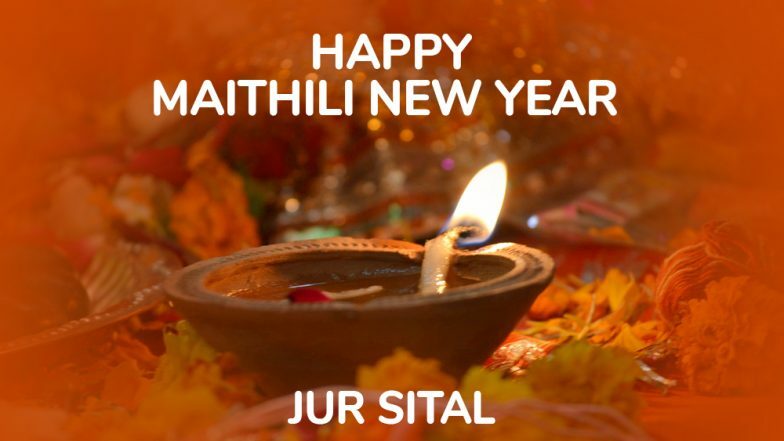 Like many Hindu New Year celebrations, Maithili people in Mithila region in Bihar observes Maithili New Year which is also called Jur Sital or Pahil Boishakh. According to the Hindu lunar calendar, the festive occasion of Satuani is in keeping with the Maithil Panchang, a calendar used in Mithila region. Celebrated on April 14, Maithili New Year 2019 or Jude Sheetal holds great significance and traditions to the people in Mithila. Shree Rama Navami 2019 Messages in Hindi. Much like its festive name, the celebration of Pahil Boishakh is similar to the Bengali New Year, Poila Boishakh. However, they keep the food light and indulge in delicacies that will keep their body calm during the spring season. Maithili New Year is also called Nirayana Mesh Sankranti and Tirhuta New Year. Sudarsan Pattnaik Extends Greetings on Nua Barsa or Maha Vishuba Sankranti to Celebrate Odia New Year. According to the Hindu legends, Jude Sheetal or Pahil Boishakh, is also the birthday of Raja Shailesh, the king of Himalayan region of Mithila. The Maithili New Year follows the Nirayanam vernal equinox, and it falls on April 30, on the Gregorian year. At times, the date may vary, but usually, April 14 marks the first day of the traditional Tirhuta Panchang. Maithili calendar begins on the same date, with Baisakh as the first month of the year. It is also observed by most traditional calendars in India such as Tamil Nadu, Assam, Bengal, Kerala, Manipur, Orissa, Punjab, Tripura and even in Nepal. During the celebration of Jur Sital, popular as Satuani, Mithila people worship chulha- traditional mud stove made from local clay used for indoor cooking. Individuals take a bath early in the morning and after the puja, the elder member of the family shred droplets of cold water on the younger ones, that is believed to keep them calm. Individuals spend time with their family members and eat their traditional food. In fact, season’s first ripe mangoes are also eaten, while welcoming the New Year. For the longest of time, the Maithili region never officially had a holiday on the festivity. It was only in 2011, when the Bihar government declared Jur Sital as a public holiday for people celebrating Mithila Diwas.